Janet Pagon Sutton, Ph.D., Raynard E. Washington, Ph.D., Kathryn R. Fingar, Ph.D., M.P.H., and Anne Elixhauser, Ph.D. This Healthcare Cost and Utilization Project (HCUP) Statistical Brief examines the characteristics of SNHs and all inpatient stays at these facilities in 2014 among 40 States that constitute approximately 90 percent of the U.S. population. SNHs are compared with non-safety-net hospitals (non-SNHs). To define safety-net status, the percentage of Medicaid and uninsured inpatient hospitals stays, out of all stays at the hospital, was computed. Hospitals were ranked within States, and SNHs were defined as those with a percentage of Medicaid and uninsured discharges in the top quartile within the State, which is consistent with past research.4,5,6 In 2014, there were 4,103 total community nonrehabilitation hospitals (i.e., acute care hospitals) across these 40 States, of which the top quartile, or 1,040 hospitals, were defined as SNHs—hospitals with the largest percentage of Medicaid and uninsured discharges. Differences between SNHs and non-SNHs of greater than 10 percent are noted in the text. Table 1 presents institutional hospital characteristics according to safety-net status in 2014. Safety-net hospitals (SNHs) were defined as hospitals with the highest number of inpatient stays that were paid by Medicaid or were uninsured (the top quartile). Although by definition SNHs represented only 25 percent of all hospitals in the 40 States included in this Brief, they accounted for 33 percent of all inpatient stays, about half of all stays that were paid by Medicaid or were uninsured (50 and 45 percent, respectively) and 43 percent of all mental health stays. Compared with non-SNHs, SNHs were more likely to be teaching hospitals, to have a large number of inpatient beds, and to be located in large central metropolitan areas. Children constituted one in five SNH stays compared with one in seven stays at non-SNHs. Maternal and neonatal stays constituted 26 percent of all inpatient stays at SNHs versus 22 percent of stays at non-SNHs. Maternal and neonatal stays at SNHs cost more and were longer than those stays at non-SNHs. The mean cost, length of stay, and number of chronic conditions among nonmaternal and nonneonatal stays were lower at SNHs compared with non-SNHs. On average, a higher percentage of stays at SNHs were admitted through the emergency department than at non-SNHs (58 vs. 46 percent of nonmaternal and nonneonatal stays). Compared with non-SNHs, nonmaternal and nonneonatal stays at SNHs were more likely to be for the mental health-related diagnoses of mood disorders and schizophrenia/other psychotic disorders. Note: SNHs were defined as those with a percentage of Medicaid and uninsured discharges in the top quartile within the State. SNHs were more likely than non-SNHs to be teaching hospitals, to have a medium or large number of inpatient beds, and to be located in large central metropolitan and micropolitan areas. Across 40 States, this Statistical Brief included 1,040 SNHs and 3,063 non-SNHs that differed on a number of institutional characteristics, including teaching status, bed size, and location. A greater proportion of SNHs (31.9 percent) were teaching hospitals compared with 16.4 percent of non-SNHs. SNHs were more likely to be categorized as large- or medium-sized hospitals (35.7 and 31.3 percent, respectively), based on their number of inpatient beds, compared with only 23.0 and 23.3 percent of non-SNHs, respectively. Non-SNHs were more likely to be small hospitals based on bed size (53.7 percent) compared with SNHs (33.0 percent). Just over a quarter (27.4 percent) of SNHs were located in large central metropolitan areas. In comparison, only 17.9 percent of non-SNHs were located in these areas. A greater proportion of SNHs compared with non-SNHs were also located in micropolitan areas (22.4 vs. 15.0 percent). Non-SNHs were more likely to be located in other types of communities, including large fringe, medium, and small metropolitan areas and rural areas (noncore). Differences in ownership by safety-net status were not greater than 10 percent. Table 2 presents demographic characteristics and the service line of inpatient stays among SNHs and non-SNHs in 2014. In 2014, SNHs provided patient care for over 10 million discharges in these 40 States. By definition, SNHs accounted for 25 percent of all hospitals, but SNHs provided patient care for nearly a third of all inpatient stays—10,008,899 discharges. Compared with stays at non-SNHs, inpatient stays at SNHs were for patients who were younger and were more likely to reside in large central metropolitan and low-income areas. The mean patient age among inpatient stays at SNHs was 43.0 years compared with 51.4 years among stays at non-SNHs (data not shown). SNHs treated a larger proportion of children and a smaller proportion of older adults than their non-safety-net counterparts. Children under the age of 18 years constituted 21.0 percent of discharges from SNHs compared with only 13.3 percent of discharges from non-SNHs. Conversely, 20.9 percent of discharges at SNHs were patients aged 65-84 years and 5.7 percent were patients aged 85 years and older, whereas 29.7 percent of discharges at non-SNHs were 65-84-year-olds and 9.2 percent were patients aged 85 years and older. Inpatient stays at SNHs also differed in location of patient's residence. Nearly 40 percent of discharges from SNHs were among patients who resided in large central metropolitan areas compared with only 27.8 percent of discharges at non-SNHs. Moreover, whereas 41.2 percent of discharges from SNHs were among patients who resided in low-income communities (ZIP Codes with median income in the lowest quartile), only 23.9 percent of discharges from non-SNHs were among patients who resided in these lowest-income communities. SNHs were defined according to their level of Medicaid and uninsured payer mix. As a result, the distribution of inpatient stays by expected payer differed substantially by type of hospital. In total, over 40 percent of discharges from SNHs had an expected payer of Medicaid (34.7 percent) or uninsured (6.7 percent), compared with 20.7 percent of discharges from non-SNHs (16.8 percent Medicaid and 3.9 uninsured). Inpatient stays at SNHs were more likely to be related to pregnancy, mental health, and injuries, whereas stays at non-SNHs were more likely to involve surgery. The distribution of inpatient stays by service line differed according to safety-net status, with maternal and neonatal discharges accounting for one in four discharges from SNHs (25.8 percent) compared with one in five discharges from non-SNHs (21.5 percent). A greater proportion of stays at SNHs also fell in the mental health (7.7 percent) and injury (5.2 percent) service lines compared with only 4.9 and 4.5 percent of discharges at non-SNHs, respectively. Discharges from SNHs were less likely to fall in the surgical service line than discharges from non-SNHs (16.4 vs. 21.3 percent). 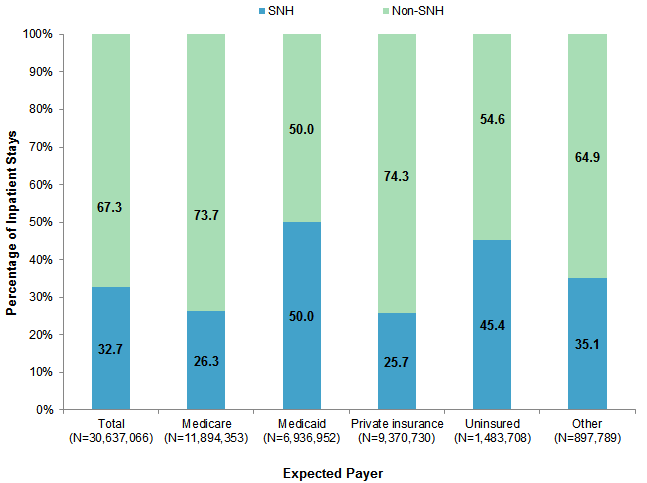 Figure 1 presents the proportion of inpatient hospital stays overall and among each expected payer category that occurred at SNHs and non-SNHs in 2014. Note that these percentages use a denominator of all stays in each payer category. In contrast, Table 2 displays the percentage of discharges in each payer category, using a denominator of all discharges at SNHs or at non-SNHs. Stacked bar chart showing the percentage of inpatient hospital stays at safety-net hospitals and non-safety-net hospitals by payer. Total (N = 30,637,066): 67.3% non-SNH, 32.7% SNH. Medicare (N = 11,894,353): 73.7% non-SNH, 26.3% SNH. Medicaid (N = 6,936,952): 50.0% non-SNH, 50.0% SNH. Private insurance (N = 9,370,730): 74.3% non-SNH, 25.7% SNH. Uninsured (N = 1,483,708): 54.6% non-SNH, 45.4% SNH. Other (N = 897,789): 64.9% non-SNH, 35.1% SNH. SNHs accounted for about one-third of all inpatient stays in 2014 and for nearly 50 percent of stays that were paid by Medicaid or were uninsured. As noted earlier, by definition SNHs accounted for one-quarter of all hospitals. However, they provided patient care for 33 percent of all inpatient stays across these 40 States in 2014, which is consistent with the finding that SNHs tend to be larger hospitals. Half of all stays with an expected payer of Medicaid and 45.4 percent of all uninsured stays occurred at SNHs, whereas only 26.3 percent of stays paid by Medicare and 25.7 percent of privately insured stays occurred at SNHs. 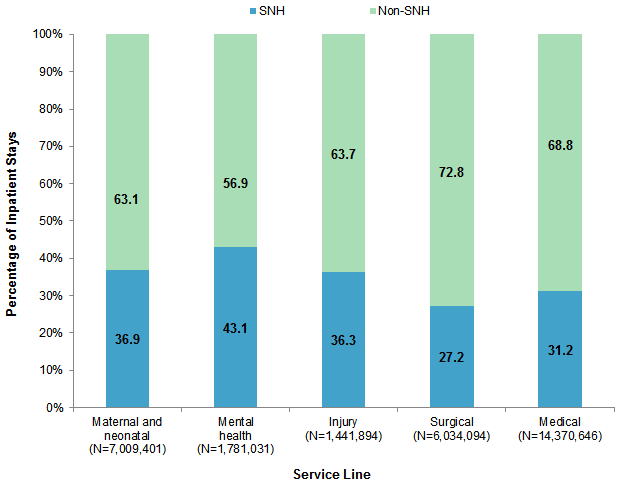 Figure 2 presents the proportion of inpatient hospital stays in each service line—maternal and neonatal, mental health, injury, surgical, and medical—that occurred at SNHs and non-SNHs in 2014. Note that these percentages use a denominator of all stays in a service line, whereas Table 2 displays the percentage of discharges in each service line, using a denominator of all discharges at SNHs or at non-SNHs. Stacked bar chart showing the percentage of inpatient hospital stays at safety-net hospitals and non-safety net hospitals by service line. Maternal and neonatal (N = 7,009,401): 63.1% non-SNH; 36.9% SNH. Mental health (N = 1,781,031): 56.9% non-SNH; 43.1% SNH. Injury (N = 1,441,894): 63.7% non-SNH; 36.3% SNH. Surgical (N = 6,034,094): 72.8% non-SNH; 27.2% SNH. Medical (N = 14,370,646): 68.8% non-SNH; 31.2% SNH. Over 40 percent of all inpatient hospital stays for mental health occurred at SNHs in 2014. Even though by definition SNHs comprise one-quarter of all hospitals, they provided care for 43.1 percent of all mental health-related inpatient stays, 36.9 percent of all maternal and neonatal stays, and 36.3 percent of all injury-related stays. Figure 3 presents measures of hospital utilization among SNHs and non-SNHs overall and by service line. The cost per stay, length of stay, and number of chronic condition diagnoses were averaged across inpatient stays at each hospital and then averaged across all hospitals, separately for SNHs and non-SNHs. Three-part bar chart showing cost, length of stay, and number of chronic diagnoses by safety-net status and service line. Mean cost per stay in dollars: maternal/neonatal: 6,310 SNH, 4,820 non-SNH; all nonmaternal/nonneonatal: 12,215 SNH, 14,943 non-SNH; mental health: 7,736 SNH, 8,820 non-SNH; injury: 13,359 SNH, 13,822 non-SNH; surgical: 22,132 SNH, 26,338 non-SNH; medical: 9,657 SNH, 12,105 non-SNH. Mean length of stay in days: maternal/neonatal: 3.3 SNH, 2.7 non-SNH; all nonmaternal/nonneonatal: 5.1 SNH, 6.2 non-SNH; mental health: 5.8 SNH, 5.7 non-SNH; injury: 4.6 SNH, 5.3 non-SNH; surgical: 5.5 SNH, 7.8 non-SNH; medical: 4.7 SNH, 5.9 non-SNH. Mean number of chronic diagnoses: maternal/neonatal: 0.5 SNH, 0.6 non-SNH; all nonmaternal/nonneonatal: 5.0 SNH, 5.5 non-SNH; mental health: 4.5 SNH, 5.0 non-SNH; injury: 4.1 SNH, 4.7 non-SNH; surgical: 4.4 SNH, 5.1 non-SNH; medical: 5.3 SNH, 5.8 non-SNH. Among maternal and neonatal inpatient stays, the average cost per stay was higher and the average stay was longer for SNHs than for non-SNHs. The mean cost per maternal and neonatal stay across SNHs was $6,310, and the mean length of stay was 3.3 days—over 20 percent higher than the mean cost ($4,820) and length of stay (2.7 days) of maternal and neonatal stays at non-SNHs. 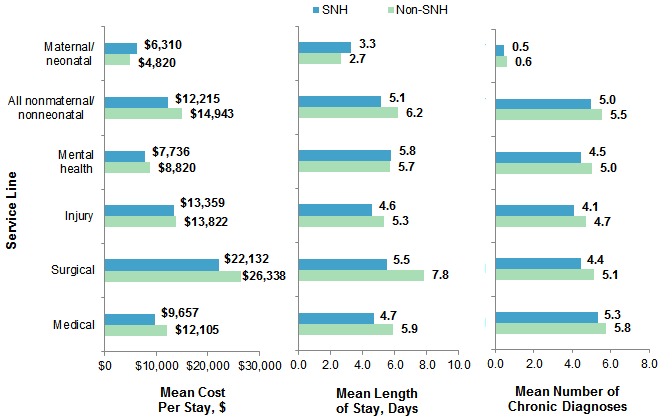 Among nonmaternal and nonneonatal inpatient stays, the average cost per stay, length of stay, and number of chronic condition diagnoses were lower for SNHs than for non-SNHs. The mean cost per nonmaternal and nonneonatal stay across SNHs was $12,215 compared with $14,943 among non-SNHs. The mean length of stay and number of chronic condition diagnoses also were lower for nonmaternal and nonneonatal stays at SNHs than those at non-SNHs (5.1 vs. 6.2 days and 5.0 vs. 5.5 chronic condition diagnoses). These trends were generally consistent across the individual nonmaternal and nonneonatal service lines—mental health, injury, surgical, and medical. 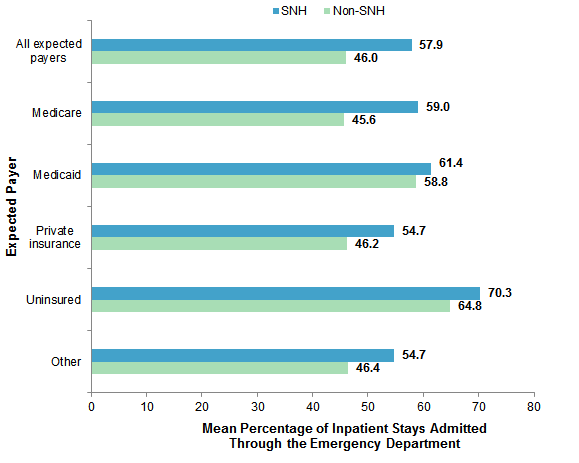 Figure 4 displays the mean percentage of inpatient stays that were admitted through the emergency department (ED) across SNHs and non-SNHs, by expected payer. The percentage of inpatient stays admitted through the ED was calculated for each hospital and then averaged across all hospitals, separately for SNHs and non-SNHs. Bar chart showing mean percentage of inpatient stays admitted through the emergency department by safety-net status and expected payer. All expected payers: 57.9% SNH, 46.0% non-SNH. Medicare: 59.0% SNH, 45.6% non-SNH. Medicaid: 61.4% SNH, 58.8% non-SNH. Private insurance: 54.7% SNH, 46.2% non-SNH. Uninsured: 70.3% SNH, 64.8% non-SNH. Other: 54.7% SNH, 46.4% non-SNH. With the exception of Medicaid and uninsured stays, SNH stays were more likely than non-SNH stays to include ED services. In general, for all nonmaternal and nonneonatal stays, a greater percentage of inpatient stays at SNHs originated in the ED (57.9 percent of stays at SNHs vs. 46.0 percent of stays at non-SNHs). However, when examined by specific expected payer, this was true only for stays with an expected payer of Medicare (59.0 vs. 45.6 percent), private insurance (54.7 vs. 46.2 percent), and Other types of insurance (54.7 vs. 46.4 percent). The mean percentage of inpatient stays with ED services did not differ by more than 10 percent across SNHs and non-SNHs for Medicaid-covered stays (61.4 vs. 58.8 percent) and uninsured stays (70.3 vs. 64.8 percent). However, the pattern was in the same direction as for the other payers. Table 3 presents the leading reasons for nonmaternal and nonneonatal inpatient stays at SNH and non-SNHs in 2014. Notes: SNHs were defined as those with a percentage of Medicaid and uninsured discharges in the top quartile within the State. Principal diagnoses were identified using the Agency for Healthcare Research and Quality (AHRQ) Clinical Classifications Software (CCS) diagnosis categories. Septicemia was the most common reason for hospitalization at both SNHs and non-SNHs. In 2014, the most frequent principal diagnosis among nonmaternal and nonneonatal inpatient stays at SNHs and non-SNHs was septicemia, which accounted for 3.9 percent of stays at SNHs and 4.6 percent of stays at non-SNHs. Compared with non-SNHs, inpatient stays at SNHs were more likely to be for the mental health-related diagnoses of mood disorders and schizophrenia/other psychotic disorders. The second most common principal diagnosis among nonmaternal and nonneonatal inpatient stays at SNHs was mood disorders, accounting for 3.1 percent of stays. In comparison, mood disorders ranked as the sixth leading principal diagnosis among stays at non-SNHs, accounting for only 2.0 percent of stays. Schizophrenia and other psychotic disorders ranked fifth among nonmaternal and nonneonatal principal diagnoses at SNHs, constituting 1.8 percent of all nonmaternal and nonneonatal stays, but did not rank in the top 10 diagnoses at non-SNHs (constituting less than 1 percent of stays at these hospitals, data not shown). Inpatient stays at SNHs were more likely to be for diabetes and skin infections, whereas stays at non-SNHs were more likely to be for cardiovascular and back problems. Three principal diagnoses that accounted for a substantial proportion of nonmaternal and nonneonatal discharges from SNHs did not appear as leading diagnoses at non-SNHs: schizophrenia and other psychotic disorders; diabetes mellitus with complications; and skin and subcutaneous tissue infections. The three highest ranked principal diagnoses at non-SNHs that were not among the 10 leading diagnoses at SNHs were cardiac dysrhythmias, acute myocardial infarctions, and spondylosis and other back problems. Table 4 presents the leading all-listed operating room procedures performed among nonmaternal and nonneonatal inpatient stays at SNHs and non-SNHs in 2014. Notes: SNHs were defined as those with a percentage of Medicaid and uninsured discharges in the top quartile within the State. Principal operating room procedures were identified using the Agency for Healthcare Research and Quality (AHRQ) Clinical Classifications Software (CCS) procedure categories. Procedures designated as Other are not reported. Inpatient stays at SNHs were more likely to involve appendectomy and less likely to involve colorectal resection than stays at non-SNHs. Appendectomy ranked ninth among the top 10 leading operating room procedures performed among nonmaternal and nonneonatal stays at SNHs, accounting for 0.7 percent of stays. In comparison, this procedure was not among the top 10 leading operating room procedures performed at non-SNHs. Colorectal resection ranked among the 10 leading nonmaternal and nonneonatal operating room procedures for non-SNHs but not for SNHs. Otherwise, the leading operating room procedures performed among nonmaternal and nonneonatal stays at SNHs and non-SNHs were similar, with arthroplasty knee being the most common procedure performed at both SNHs and non-SNHs but at different rates. Although arthoplasty of the knee was the first-ranked procedure at both types of hospitals, only 1.2 percent of stays at SNHs involved this procedure compared with 2.5 percent of stays at non-SNHs. The estimates in this Statistical Brief are based upon data from the Healthcare Cost and Utilization Project (HCUP) State Inpatient Databases (SID) from 40 States in 2014: Arkansas, Arizona, California, Colorado, Connecticut, Florida, Georgia, Hawaii, Iowa, Illinois, Indiana, Kansas, Kentucky, Louisiana, Maryland, Michigan, Minnesota, Missouri, Montana, North Carolina, North Dakota, Nebraska, New Jersey, New Mexico, Nevada, New York, Oklahoma, Oregon, Pennsylvania, Rhode Island, South Carolina, South Dakota, Tennessee, Texas, Virginia, Vermont, Washington, Wisconsin, West Virginia, Wyoming. CCS categorizes ICD-9-CM diagnosis codes and procedure codes into a manageable number of clinically meaningful categories.7 This clinical grouper makes it easier to quickly understand patterns of diagnoses and procedure use. CCS categories identified as Other typically are not reported; these categories include miscellaneous, otherwise unclassifiable diagnoses and procedures that may be difficult to interpret as a group. Operating room procedures are defined as major diagnostic and therapeutic procedures, which include all procedures considered valid operating room procedures by the Diagnosis Related Group (DRG) grouper and that are performed for diagnostic or therapeutic reasons. Total hospital charges were converted to costs using HCUP Cost-to-Charge Ratios based on hospital accounting reports from the Centers for Medicare & Medicaid Services (CMS).11 Costs reflect the actual expenses incurred in the production of hospital services, such as wages, supplies, and utility costs; charges represent the amount a hospital billed for the case. For each hospital, a hospital-wide cost-to-charge ratio is used. Hospital charges reflect the amount the hospital billed for the entire hospital stay and do not include professional (physician) fees. chronic or nonchronic. The definition of chronic conditions was based on the Chronic Condition Indicator, which can be found at http://www.hcup-us.ahrq.gov/toolssoftware/chronic/chronic.jsp. Discharges were categorized into five service lines as defined in Table 5 and based on the following hierarchical order: maternal and neonatal, mental health, injury, surgical, and medical. Injuries are identified using the principal diagnosis and a scheme recommended by Safe States Alliance, which was previously known as the State and Territorial Injury Prevention Directors Association (STIPDA). The diagnosis codes in the range 800-999 used to identify injuries are listed below. 909.3, 909.5:Late effect of complications of surgical and medical care and late effects of adverse effects of drug, medicinal, or biological substance. Surgical stays are identified by a surgical Diagnosis Related Group (DRG). The DRG grouper first assigns the discharge to a major diagnostic category (MDC) based on the principal diagnosis. For each MDC, there is a list of procedure codes that qualify as operating room procedures. If the discharge involves an operating room procedure, it is assigned to one of the surgical DRGs within the MDC category; otherwise, it is assigned to a medical DRG. For other information on hospital characteristics, refer to the HCUP Statistical Briefs located at http://www.hcup-us.ahrq.gov/reports/statbriefs/sb_hospcharacteristics.jsp. Sutton JP (Social and Scientific Systems), Washington RE (Council for Affordable Quality Healthcare), Fingar KR (Truven Health Analytics), Elixhauser A (AHRQ). Characteristics of Safety-Net Hospitals, 2014. HCUP Statistical Brief #213. October 2016. Agency for Healthcare Research and Quality, Rockville, MD. http://www.hcup-us.ahrq.gov/reports/statbriefs/sb213-Safety-Net-Hospitals-2014.pdf. The authors would like to acknowledge the contributions of Tim Kenney of Kenney IS Consulting, Inc. and Minya Sheng of Truven Health Analytics. This Statistical Brief was posted online on October 25, 2016. 1 Lewin ME, Altman S, eds. America's Health Care Safety Net: Intact but Endangered. Institute of Medicine Committee on the Changing Market, Managed Care, and the Future Viability of Safety Net Providers. Washington, DC: National Academies Press; 2000. 2 Lukas C, Holmes S, Harrison M. Can safety net hospital systems redesign themselves to achieve financial viability? Health Affairs Blog. March 16, 2015. http://healthaffairs.org/blog/2015/03/16/can-safety-net-hospital-systems-redesign-themselves-to-achieve-financial-viability/. Accessed August 29, 2016. 3 Ku L, Jones E, Shin P, Byer F, Long S. Safety net providers after health care reform: lessons from Massachusetts. Archives of Internal Medicine. 2011;171(15):1379-84. 4 Reiter KL, Jiang HJ, Wang J. Facing the recession: how did safety-net hospitals fare financially compared with their peers? Health Services Research. 2014;49(6):1747-66. 5 Andrews RM, Stull DE, Fraser I, Friedman B, Houchens RL. Serving the Uninsured: Safety-Net Hospitals, 2003. HCUP Fact Book No. 8, AHRQ Publication No. 07-0006. Rockville, MD: Agency for Healthcare Research and Quality; 2007. http://archive.ahrq.gov/data/hcup/factbk8/factbk8.pdf. Accessed August 29, 2016. 6 Cunningham P, Felland L. Environmental Scan to Identify the Major Research Questions and Metrics for Monitoring the Effects of the Affordable Care Act on Safety Net Hospitals. Center for Studying Health System Change, prepared for the U.S. Department of Health and Human Services. June 2013. https://aspe.hhs.gov/sites/default/files/pdf/33811/rpt_ACA_and_Safety_Net_%20EnvScan.pdf. Accessed August 29, 2016. 7 Agency for Healthcare Research and Quality. HCUP Clinical Classifications Software (CCS). Healthcare Cost and Utilization Project (HCUP). Rockville, MD: Agency for Healthcare Research and Quality. Updated June 2015. http://www.hcup-us.ahrq.gov/toolssoftware/ccs/ccs.jsp. Accessed February 17, 2016. 8 Cunningham P, Felland L. Environmental Scan to Identify the Major Research Questions and Metrics for Monitoring the Effects of the Affordable Care Act on Safety Net Hospitals. U.S. Department of Health and Human Services. June 2013. https://aspe.hhs.gov/sites/default/files/pdf/33811/rpt_ACA_and_Safety_Net_%20EnvScan.pdf. Accessed August 29, 2016. 9 Reiter KL, Jiang HJ, Wang J. Facing the recession: how did safety-net hospitals fare financially compared with their peers? Health Services Research. 2014;49(6):1747-66. 10 Andrews RM, Stull DE, Fraser I, Friedman B, Houchens RL. Serving the Uninsured: Safety-Net Hospitals, 2003. HCUP Fact Book No. 8, AHRQ Publication No. 07-0006. Rockville, MD: Agency for Healthcare Research and Quality; 2007. http://archive.ahrq.gov/data/hcup/factbk8/factbk8.pdf. Accessed August 29, 2016. Internet Citation: Statistical Brief #213. Healthcare Cost and Utilization Project (HCUP). October 2016. Agency for Healthcare Research and Quality, Rockville, MD. www.hcup-us.ahrq.gov/reports/statbriefs/sb213-Safety-Net-Hospitals-2014.jsp.